Fast and easy alternative to the find and replace fill and outline colors in CorelDraw. Also save your own custom presets! Works on multiple pages, in Powerclips, and Groups. Newly added 4-7-2014 in X6 and X7 version: You can now optionally work with locked layers, and an option to work with only the active layer. 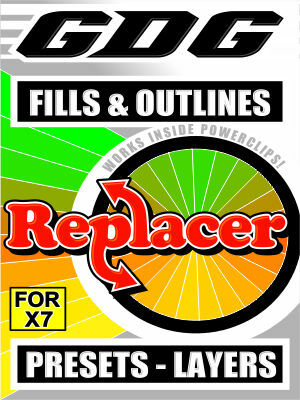 Newly added 5-2-14 in X6 and X7 version: Macro works in Powerclips. I also added more tips and notices that appear to help you understand macro. Also other minor fixes. Note: Possible issue with spot colors. Use the GET feature of the macro instead of the eye dropper if you run into any issue where macro is not doing a find and replace on a spot color. This is a possible CorelDraw issue whereas the eyedropper in Draw does not collect all properties of spot color. This is a minor issue and you may or may not experience it. Use the GET in the macro instead of eyedropper if you experience this bug. See pictures and videos below. Demo video uses X5 version but functionality is very similar. This version is for X7.